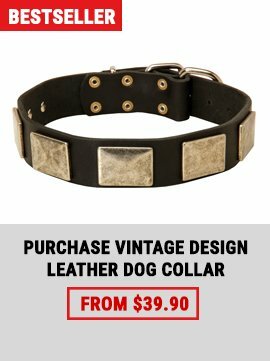 Is your Pitbull ready for training on the substantial biting surface? 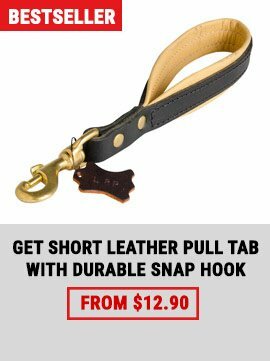 Get him this Extra Large Leather Bite Tug and you’ll see a great difference! 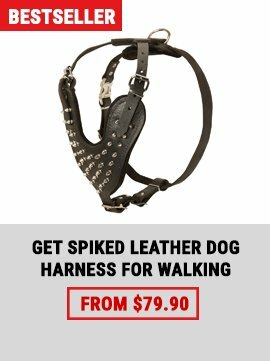 This gear is made of natural cowhide and fabric nontoxic stuffing, and also equipped with 2 strongly stitched nylon handles. All these features mean extreme durability and convenient use. 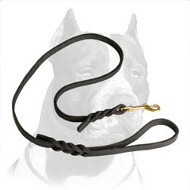 This leather bite tug is meant for upper-intermediate dog training, as the next step after using the tugs with fiber surface. 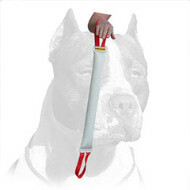 After your Pitbull gets experienced with the offered tug, you can confidently start sleeve training as the advanced level of bite and grip development. 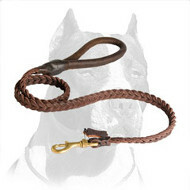 This leather tug is easy in maintenance and resistant to dog bites. The surface is more complicated to puncture involving more efforts and strength of the dog. The gear is also heavy-stuffed which requires the dog to open the mouth wide. 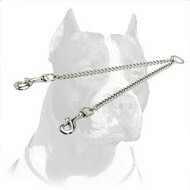 This challenging work builds stronger jaws and muscles of your Pitbull. The tug is equipped with two nylon handles, which allow you to extend the sphere of its use. They also make it possible to grab the tug firmly and to avoid injuries.